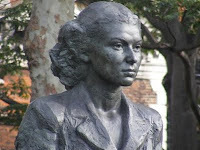 Pictured is the recently opened memorial on the South Bank which commemorates Violette Szabo and other members of the Special Operations Executive who fought during the Second World War. The monument was unveiled by World War Two veterans, the Duke of Wellington and the Mayor of Lambeth, Christopher Wellbelove. Szabo was a single mother (her husband was killed at El Alamein) who grew up in Stockwell. She ran undercover operations against the Nazis from offices in Baker Street. There is a blue plaque on Burnley Road, Stockwell, where Szabo lived. Tragically, she died aged just 23 after being captured and killed in a concentration camp. Her work is celebrated in the film, ‘Carve her name with pride’.